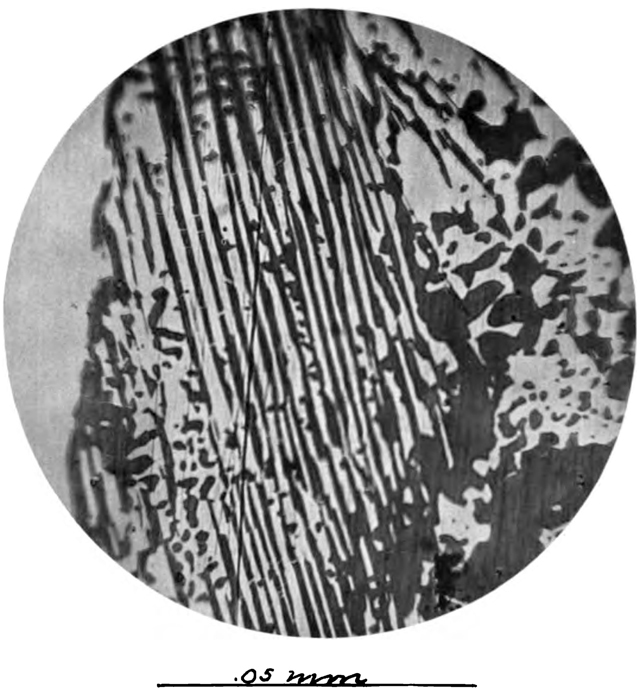 Photomicrograph of a very highly magnified area of the section shown in (A). It may be noted that two types of structure are shown, one decidedly lamellar, and the other, normal graphic intergrowth, shows a very marked resemblance to pearlite in steel. Pearlite consists of a kind of mechanical mixture of ferrite (free alpha iron) and cementite (Fe2C) to which Howe applied the term eutectoid. The two constituents in pearlite certainly solidify contemporaneously as the melt cools. In the case of the sulphides here shown it is not known whether or not the two were deposited contemporaneously, but it is made clear by etching the polished surface that the intergrowth is along crystallographic directions — cleavage or parting planes in the chalcocite, and that it is therefore a crystallographic intergrowth. It is also interesting to note the extremely minute lines of chalcocite crossing through the bornite and joining adjacent lamellae of chalcocite. Geologist, mineralogist and metalographist. Early in life he served as an apprentice cabinet maker, and even after obtaining his degree in geology he continued his interest by collecting rare masterpieces of cabinet work and old rare woods. He headed the geology department at the University of Idaho (Moscow) from 1920 until his death (by heart attack, while working in his garden) in 1938. Laney’s papers are at the University of Idaho; a guide to the papers, and biographical information, are found here. And so with cabinetry (and rare woods) in his makeup, Laney would recognize and linger over good workmanship (including geological process) and aesthetic qualities. I surmise.